Poison ivy are plants that can occur anywhere, even in your own backyard. Poison ivy’s green leaves tend to camouflage well with other harmless plants and brush, so it is possible to touch it without being aware. You will notice that you had contact with poison ivy, only after the horrible rash and itching begins. Although it is a rational start, it will not be enough to know what poison ivy looks like, in protecting yourself from it. Poison ivy exists in several types, and looks different depending on the time of year. If you become affected by poison ivy there are several natural as well as homeopathic remedies that can be used to effectively treat the resulting rash. Rubbing alcohol is recommended by many dermatologists–apply it liberally to skin and any part of clothing that is exposed to poison ivy. After this, thoroughly wash with water. This can be done at anytime within four hours of the initial exposure. Alcohol will draw out the toxic oils from the skin and clothing and prevent or reduces rash and itching. Aloe Vera juice will work effectively to stop itching and blistering. It enhances the healing process of rashes and sores; apply it as often as every two hours after exposure. 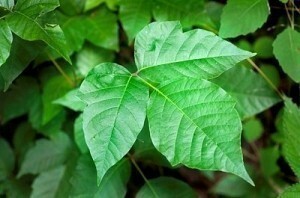 Baking soda or bicarbonate of soda is a very useful natural remedy for poison ivy rash. Place a tablespoon of baking soda in 1 cup of water and use the mixture to wash the affected area, or make it into a poultice. Change often to keep the application cool and cover open blisters with sterile gauze. Alternatively, you can use the baking soda to make a thick paste and apply it to the affected areas. Household bleach is good to remove poison ivy resin and treat the itch. Dab the affected area with cotton balls soaked in a mixture of equal parts water and bleach. This mixture, when applied to blisters, should clear them up within a day. If the bleach irritates the skin, make a wet compress and add some table salt or Epsom salts and apply for 30 minutes, as an alternative. This will promote the drying out of the area. Oatmeal can be used in several ways to effectively treat poison ivy rash. First, cooked- allowed to cool down, and then applied to the affected area. If the whole body is affected, place ¾ of a box of oatmeal in a bathtub halved with warm water and soak in it for a while. The oatmeal can also be placed in a sock and swirled around in the bath water. When getting out of the water, refrain from drying off so the oatmeal will leave a film on your skin; this will help to ease the itch. Rhus tox 30c. Taken once monthly will prevent problems from poison ivy. It should be taken sublingually (that is, under the tongue). Rhus tox 6c. Will heal poison ivy within a few days if used.